Social media after death: has the human race achieved immortality? This is a feature story done for Cloud 961 Magazine Issue 4. The main purpose of medicine and the thousands of years of trying to perfect it is to extend a human’s life and eventually achieve immortality (through robotics for example). What the internet, social networks in particular, unexpectedly achieved is another type of immortality: digital immortality. Yet, people don’t usually think about what happens to their social profiles online once they are deceased, until they are forced to when someone close to them dies. According to a study done for the purpose of this article, 65% of the respondents have at least one deceased person as a connection on their social media platforms. Only 12%, however, are aware of Facebook’s and Twitter’s procedures for deceased people. Facebook’s official policy for deceased people who have profiles on their site is to turn it into a memorial where “people can save and share their memories of those who've passed.” This setting hides the profile from people who are not connected to the deceased person, removes old status updates and contact information, disables the ability to log into the account and no longer suggests this person as a recommended connection to other people. To request this setting, family or friends of the deceased have to fill in a special form for this purpose and have to submit a proof of death, such as an obituary, death certificate or news article. Twitter on the other hand would close a profile of a deceased person and provide an archive of their public tweets if requested by family members. Linkedin offers a similar procedure where a “Verification of Death Form” must be submitted online through DocuSign and proof of death is needed. However, anyone can submit this form, not necessarily friends or family. Linkedin, in this case, would delete the deceased person’s profile from its site. All social networks also agree that they do not grant access to private information to anyone, including family, in case the account creator died, unless ordered by court. This is a crucial regulation that ensures the privacy of the deceased person and prevents conflict, even though 19% of our survey respondents said that family or friends should have access to their accounts after death while 69% said that they would give their passwords to trusted friends/family members to access or delete their accounts after death. Interestingly, there are services that are dedicated for managing a person’s online presence after death. Legacy Locker is one of them. Users can create a free account to store three assets such as login information to their accounts or an online will and designate one person who can access this information after they pass away. Other startups help users post to their social media platforms after they die. DeadSocial allows users to schedule posts long into the future for the purpose of being able to say final goodbyes after a person has passed away. It covers Facebook, Twitter and Linkedin platforms. Similarly, If I Die can send private Facebook messages or emails that contain more personal content such as confessions of love, apologies, secrets or bank information only after three trusted people have confirmed a person’s death. Another startup that may be a bit more extreme is _LivesOn. Rather than just scheduling future posts and messages, this service studies a person’s twitter account while alive to understand the behavior of the person (tweets, favorites, retweets, and writing style). After that person passes away, this program mimics the person’s tweets and creates new content using artificial intelligence. In other words, it would carry on tweeting using the person’s voice and serves as a content-recommendation engine as per the person’s personality. The topic of death might still be a taboo, but social networks are forced to implement regulations for the millions of deceased users on their platforms. Some startups have turned this into potential businesses while others are trying to make this transition as smooth as possible. Social networks have now gotten the human race closer to immortality, but the question remains: where do you draw the line between what’s acceptable and what’s creepy? 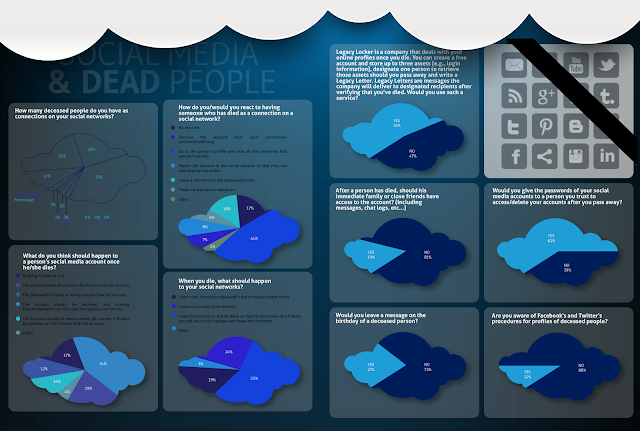 Click to see the full size inforgraphic which was produced for the purpose of this survey.